Abellio/JR East joint venture wins West Midlands franchise, Signalling delays mar successful Waterloo upgrade, Six new stations for England and Wales, Heritage Lottery Fund chairman to reopen refurbished Barrow Hill roundhouse, Caledonian Sleeper Mk5s on test in Czech Republic, Scottish debut for Virgin IET. 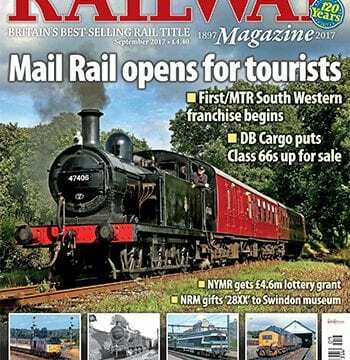 NRM ‘28XX’ gifted to STEAM Museum, Scots Guardsman bows out, Swanage hires ‘T9’ after losing two locos in shed collision, NYMR scoops £4.6m lottery grant. DB Cargo puts 10 Class 66s up for sale, SWT Class 707s finally enter service, Investigation into Class 455 traction equipment ‘explosions’, TfL ups Class 345 EMU order. Lee Valley gets £170m upgrade, masts up on Cannock Chase and Shotts lines, Fylde signalboxes under threat. Pip Dunn recalls the summer holiday trains that took a wide variety of freight-only diesels from the East Midlands and Yorkshire to the Lincolnshire Coast between the 1970s and the early-1990s. This month marks the 60th anniversary of the closure of more than 200 miles of lines in the north-west corner of Ireland. 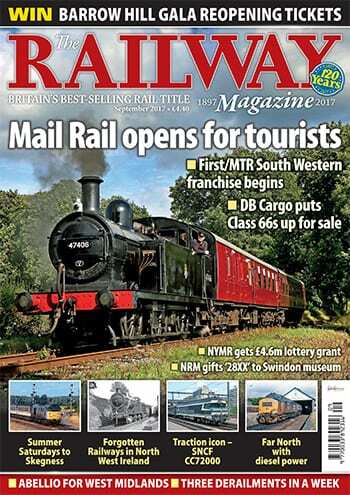 Neil Sprinks looks back and finds out why the region’s railways were decimated almost overnight. Keith Farr returns to the Far North Line to review the performance of diesel locomotives and DMUs over the difficult road to Wick and Thurso, looking at the Sulzer Type 2s of the 1960s and 1970s, the ‘37s’ of the 1980s, and the current ScotRail Class 158s. The Embsay & Bolton Abbey Railway has gone from strength-to-strength since it reopened part of the Skipton to Ilkley line to tourists in 1981. Mark Smithers visits the Yorkshire Dales to discover the railway now has its sights set on reaching Skipton. Late August saw the last booked workings of the most powerful diesel locomotives in France – the SNCF CC72000s. Ben Jones takes a brief look at the reasons behind their development, where they worked, and their gradual decline over the last decade. Mail Rail system, which is now carrying passengers for the first time in its history.